Design by Ron Rezek, 1998. Made in the U.S.A. for Rezek by Artemide. 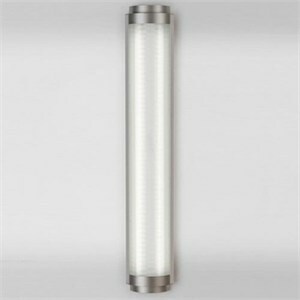 Wall mounted luminaire for diffused fluorescent lighting, particularly suited for bathroom mirror applications. Diffuser in opal white acrylic. Body in extruded aluminum with anodized or white powder coated finish. End caps in die-cast aluminum in matte nickel plating or matte white powder coat finish. Mounting to standard electrical junction boxes at center of luminaire.